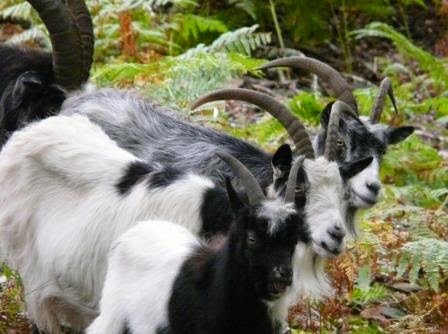 Twin kids were born into our local gang of goats in February. After years of decline, from six adults down to three, we were beginning to worry about their future; kids were either not being born or not surviving. But this year’s twins were looking fit and strong on the drive this morning. Only one of them chose to pose in this family photo; kid to the front, then Mum and Auntie behind with Billy in top left hand corner. Was he the Dad? The strong black and white markings suggest it might have been a Billy from above the railway line but we’ll never know. He was definitely looking frisky today as he flirted with Auntie. Going down the drive I spotted a future supper. At eye level, sprouting from an oak, was a tiny chicken of the woods; a very tasty mushroom. It has only formed in the last couple of days and at the moment it’s more of a chick than a hen. These fungi can grow very big, maybe a couple of kilos in weight. Could be in for a season of mushroom omelettes. I think it’s posh name is Laetiporus sulphurous. Last year there was a huge specimen the other side of the drive and I’d noticed it a few times since we’ve been living here. But there’s no point looking for that one at the moment, they only grow every other year. On Tuesday I went on a scything workshop at which I learnt many things including how to sharpen a scythe. Sharpening is recommended every two to three minutes, but after a whole day of scything, no amount of sharpening will make the blade fit for cutting grass. Every eight hours it is time to ‘peen’ the blade. Not a word I was familiar with but basically it involves bashing the blade with a hammer via a peening rig. It’s a bit like being a blacksmith but without the heat; ‘cold forging’ so to speak. By bashing the blade you squeeze the metal outwards to create the right profile ready for sharpening. A couple of days later I was cooking a seared carpaccio of beef for some friends for which thinly sliced rare beef is of the essence. All our kitchen knives are pretty blunt and don’t respond to sharpening. So I took the cheapest knife out to the workshop, bashed the hell out of it with a hammer onto the edge of the vice, then sharpened it with a wetstone and hey presto it cut like a razor blade. Could knife sharpening be my next career move? As for the scything, this is what it looked like; Tai Chi with a blade. So much more pleasant than strimming. I took Molly for a walk this afternoon, through the nature reserve. The bracken had started to fall over and patches of purple heather were sprouting forth. Some impressive mushrooms too. But the biggest good news was to see scaffolding around Tŷ Hovendon, the railway inspector’s house in Coed y Bleiddiau. This might be a preliminary stage to secure the roof before the long awaited restoration of the house. I’ve heard that The Landmark Trust is taking a long lease from the Ffestiniog Railway and will run it as a very special holiday cottage; targeted at people wanting to get away from it all, maybe penning the final chapters of a book. Holiday guests and their provisions will be transported by special trains from Porthmadog with daily deliveries of milk. They will be our nearest neighbours! Over the summer I’ve been cultivating parts of the veg patch where soil has not seen the light of day since probably WWII. Today I tackled a stony section leading up to the wall and next to one of several compost heaps. My faithful Molly was almost by my side all day, transfixed by something inside the dry stone walls; the sun was strong and she was panting but even when I went to the house and fetched her a bowl of water, she would not pause her gaze for fear she’d miss the moment. I was glad she was preoccupied when the earth before me started to move; not an earthquake but a mole whose snout broke surface and quickly retreated. I watched its progress as it tunnelled the few feet to the compost heap. A few minutes later it returned going the other way and the dry crumbly soil above it subsided, briefly revealing the black moleskin boiler suit. I nipped up to the house to get a camera ready for any next appearance. But alas the mole did not return and I worked my way up the garden removing chunks of a rotten tree stump. As I pulled away at a large bit of root a male slow worm fell onto the bare soil; just as well I had the camera – beautiful. After lunch, Molly still staring into the wall, I was removing some weeds beside the old tree stump and noticed a lizard in the wall. The camera was recharging up at the house but my mobile phone recorded the moment. And shortly after that, there was another lizard, possibly called Swampy, which stared me down, intent on preserving its homelands. Taking note of the protest I have decided that this little patch of garden does not need to be cultivated; it obviously has a more noble purpose than food or flower production.